Finding a unique golf gift for someone special can be a tremendous challenge. Golfers are notorious for buying the latest and greatest piece of equipment or gadget as soon as it comes out. 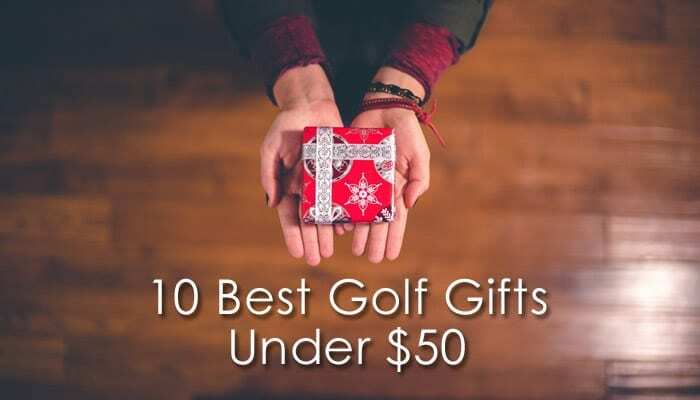 Finding a unique golf gift for under $50 takes this challenge to a MUCH higher level. There are only so many products in the golf world that fall in this price range. To help you find that perfect gift – within your budget, the editors of Chicago Golf Report have assembled this list of some of our favorite products from 2018. They’re all unique, quality products and are under $50! 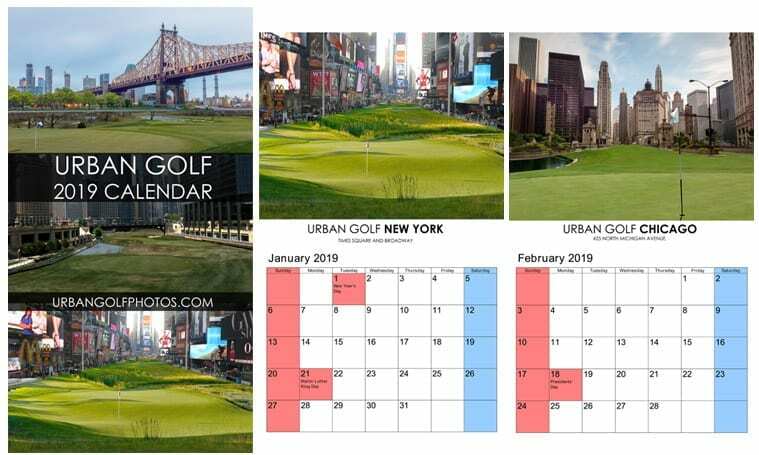 If you’re looking for something unique, the 2019 Urban Golf calendar is the answer. Each month features a golf hole dropped into one of the most unlikely urban places on earth. What if there was a golf hole in the middle of Times Square in New York City? Or on the streets of the Magnificent Mile, Michigan Avenue in Chicago? Or in place of the fountains at the Bellagio Hotel and Casino in Las Vegas? All of these incredible dream golf holes, and many more, are featured in this beautiful 9.5″ x 17.25″ 12-month 2019 calendar. This is one gift you can guarantee your favorite golfer hasn’t seen before. The PuttOut Pressure Putt Trainer is one of those unique golf training aids that works and can actually be beneficial without the need of your PGA professional. This product allows you to work on controlling the pace and alignment of your putts, while providing immediate feedback on the quality of your stroke – all in the comfort of your own home. Putting to pace is primarily the difference provided by the PuttOut Pressure Putt Trainer. Hitting the microtarget at the top of the slope requires both proper pace and alignment. It’s small and portable, which makes it easy use just about anywhere. It was also named a 2018 Editors’ Choice pick by Golf Digest and Golf Monthly. If you play enough golf, it’s not a matter of if, but when you’ll get caught in the rain. And once you’re playing in the rain, the clock is ticking on how long you’ll be able to keep your grips dry and usable. Playing in the rain can add an entirely new level of stress to the game, unless you’ve got RainGrip gloves from Footjoy. They take away the concern about slick, slippery grips caused by moisture. You’ll actually welcome a shower since you’ll still have great control of the club, while your playing partners may not. Once these Rain Grip gloves get wet, your grip will stay tacky during even the most torrential downpour. These gloves are a must for any serious golfer. They’ll allow you to swing with confidence without having to worry about the club slipping or twisting. TopGolf has been the hottest thing in golf for quite awhile and it’s showing no signs of slowing down. It’s a great place for anyone to experience golf in a fun, relaxed setting. TopGolf balls have microchips inside of them that track each shot’s accuracy and distance while awarding points for hitting targets in an outfield. There are eleven targets that look like huge dart boards on the ground. Hit a target and you score points. Oh yeah, there’s also music, food and drinks! 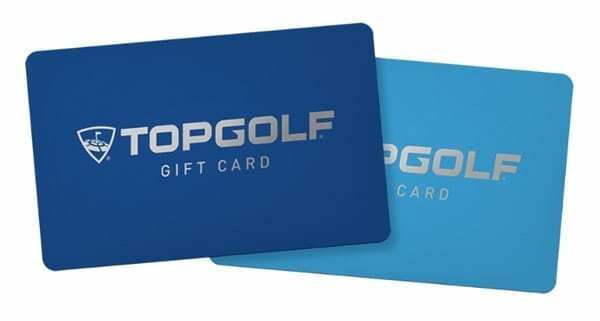 Topgolf Gift Cards are the perfect gift for anyone, whether they play golf or not. The gift cards are redeemable on Topgolf game play, food and drinks, lifetime memberships, lessons, and gear. There are no fees or expiration dates. Just pay the face value (plus shipping for physical cards), and your cards will never expire and are valid at all Topgolf location in the United States. Most golfers have some form of golf art in their home or office, which is why Urban Golf is the next perfect gift for their living space. Urban Golf posters and framed art pieces feature fictional golf holes dropped into the some of the most iconic, urban settings in the country. 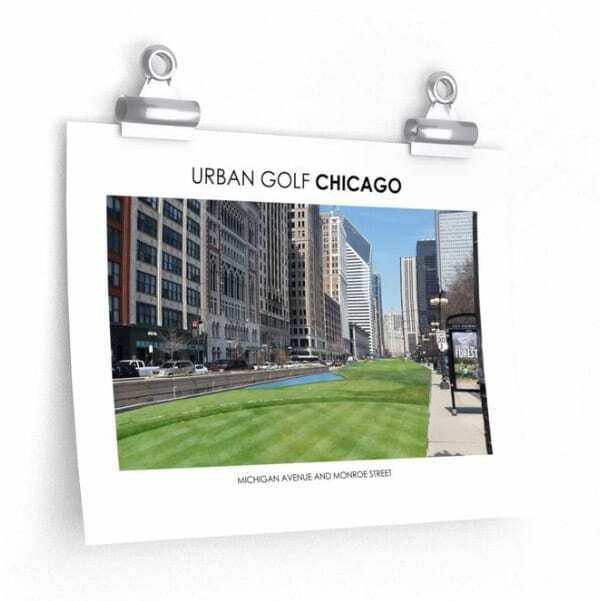 Imagine playing golf on Michigan Avenue or on the streets of Manhattan or Las Vegas. You have to see these fictional golf holes to believe them. They’re beautiful and are a man cave must for any golf nut in your life. Making a tee time can be the biggest challenge of the day for many of us. We arrive two minutes before we’re scheduled to tee off, requiring us to grab everything and anything from our trunk in the hopes of not being chastised by the starter. This frenetic life can take a toll on your trunk, which can often become a disaster. That’s where a tool like the Callaway Golf Trunk Organizer comes in handy. The Callaway Golf Trunk Locker is perfect for organizing the golf stuff in your trunk. It features easy-access storage compartments with rigid wall dividers and easy-pull zippers. The shoe compartment has mesh for ventilation and it collapses flat for easy storage. 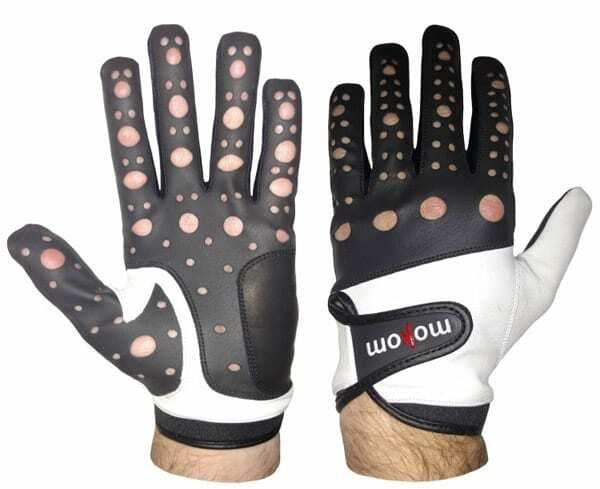 Give the gift of a great grip with the innovative new golf glove from Mokom, which features a precision laser cut hole pattern for strategically exposed skin. This hole pattern allows your skin to have much more direct contact with the club than a traditional glove. Made from high quality leather, the Mokom glove offers a unique combination of feel and consistent grip, allowing for better touch, resulting in decreased grip pressure. This is a durable glove that works well in all conditions. In our testing, the Mokom glove out performed all other gloves in difficult conditions. Your handgrip, tactile sensitivity and manual dexterity will actually improve in moisture and cold conditions that typically adversely affect most other gloves. If you’ve ever forgotten to clip a towel to your golf bag, you’re aware of just how often you need one throughout your round. Nearly every shot requires a towel to clean the club face and every time you reach the green, your golf ball needs to be cleaned. This convenient microfiber towel is a valuable gift for every golfer due to it’s microfiber fabric, which cleans better than most traditional towels. It comes in an ideal size at 16” x 16” and is super-absorbent with an easy-to-use carabiner clip. Bulky over-sized golf towels are no longer necessary. This Microfiber Greens Towel is a great value at a great price. Every golfer needs a dependable, durable golf umbrella that they can count on when the skies open up and the rain begins to fall. The G4Free Ultimate Golf Umbrella will protect you from anything that mother nature can throw at you; rain, hail or shine. The canopy uses water-resistant lightweight, mold resistant and quick drying 210T pongee micro-weave fabric. It also provides protection from the sun with SPF 50+ protection, which blocks 99.95% of UV rays. The double-canopy design and durable steel frame make this umbrella virtually windproof. The double-canopy design creates a vent allowing the wind to pass through, making the umbrella solid enough to handle extremely harsh conditions on the golf course. The umbrella comes with a money back guarantee against any defects in craftsmanship. The G4Free Ultimate Golf Umbrella is an ideal companion for virtually any golfer. Even if they can’t play like one, you can help someone find out what it feels like to be a professional golfer. GolfJet is known for providing Tour pro treatment, with monthly subscription services that send golf balls, gloves and more to anywhere in the world. A primary focus for the company is their golf ball, of which they have two versions, the JET3 and the JET4. The former was designed for players with higher swing speeds, providing a flatter trajectory path for greater overall distance. The JET4 was built to provide a low spin, arced trajectory flight path for golfers with a wide variety of swing speeds. The JET3 3-piece construction uses a single core for golfers who prefer flat trajectory drives and the softest short game feel while the JET4 4-piece construction is engineered for ultimate distance and short game spin due to the 2-piece core. JET4 is generally for golfers with handicaps greater than 20 and JET3 is for golfers with handicaps less then 20.